The first week of our recent mission trip to Ethiopia was spent in the capital city of Addis Ababa. Although this nation is thousands of years old, this city of over 3 million people is the first permanent capital of the country. It was established in 1889 when King Menelik II imported eucalyptus trees from Australia; the fast growth rate of these trees made it possible to have a ready supply of wood for building and fires. Prior to this, the capital was moved every few years as the supply of firewood was exhausted. Today “Addis” is a city of rapid growth. It resembles a gangly teenager, stuck between the primitive and modern eras. Rules of traffic have little to do with road markings: donkeys, goats, and other animals share the road with people, cars, and trucks. Mud hovels stand next to 4-story apartment complexes with satellite dishes perched on the porches. An open-air slaughtery is within simple walking distance of elaborate embassies. Living complexes are ringed with high walls to deter night thievery; inside the complexes are single-story, 1-2 room living quarters. Most kitchens are in the open air over wood fires, so wood smoke floats freely, mingled with the exhaust of cars and trucks. About 50,000 children (plus countless adults) in the city are homeless; so plastic tarps or corrugated tin lean-tos dot the sidewalks. The best prices are usually found at shops in the “Mercado,” a giant area of small, crowded shops; here the most expert thieves also are found! Addis has opportunities not found anywhere else in Ethiopia. People flock to Addis, looking for the possibility of an education or a job. The unemployment rate is very high, so social unrest usually starts in Addis, fueled by disillusion and unemployment. Since the election 8 months ago, the peace of Addis has been very delicate. After 27 hours of travel, our flight arrived in Addis about 9:30 pm. Our first 3 hours in Ethiopia were spent dealing with the customs authority, while our sons waited patiently beyond the security guard. In the end we paid about $700 for 2 laptops, 1 projector, and 2 DVD players; the next day we paid another $450 for the other projector. They didn’t charge us for the printers, 2 new laptops, 3 cameras, or 3 cassette recorders. We were the last to leave the airport, so they allowed our son Bereket beyond the guard, carrying 1 ½ dozen long-stem red roses for their Mama B. The next Sunday, at our invitation, the customs man was in church service with us! We spent a week in the city, focused on 3 objectives. #1 Logistics…exchange money, secure important documents, open bank account, buy Bibles, etc., etc. The exchange rate is the best it has ever been…9 Ethiopian birr to 1 US Dollar. A week before we left, we were notified that the price of the Bibles had gone up…we needed an additional $600! Within days of our departure, without knowing of the need, our home church here in Virginia took a love offering of $516, and one of Dave’s students gave us a check for $100. Once again, our Lord had provided everything we needed. 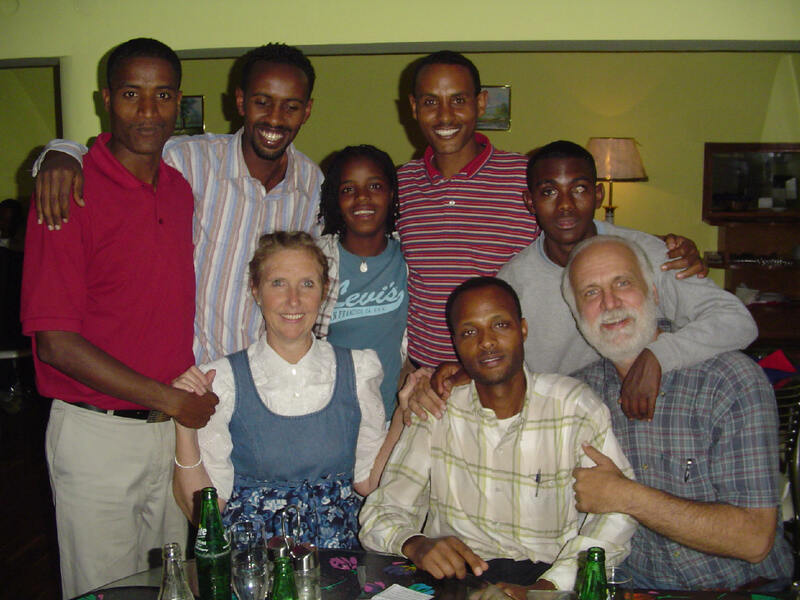 #2 Family… we spent every waking minute with our Ethiopian sons and daughter. Each has a story of God’s personal mercy. Four of them are fatherless. One comes from a Muslim family; he’s recently changed his name from Ahmed to David. 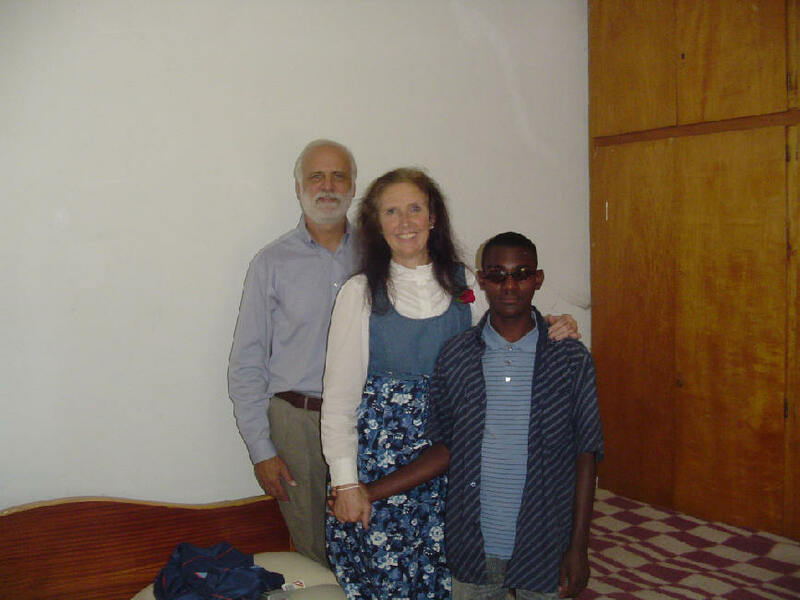 Bereket is sporting a new, clear eye since his corneal transplant; it looks beautiful and his vision is now about 80/20, but is very light-sensitive. Emebet, our daughter, lives in a girls home sponsored by the SIM Mission; she was on the street for 8 years before that, having been thrown out by her step-mother. Only two come from relatively stable Christian homes. 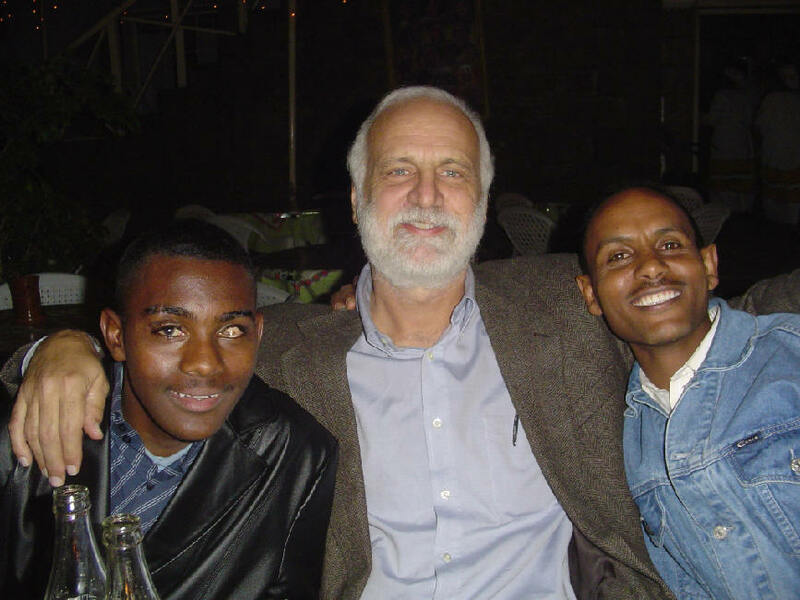 Generally speaking, the Ethiopian family is extremely dysfunctional, due in large part to the extreme poverty that saps the energy of parents. From the time they are walking, children are on their own; where they sleep or eat is very fluid. Culture requires hospitality, so beds and meals are freely shared with whoever shows up. As such, parental protection, training, and care are minimal, and children learn early in life how to survive. Unfortunately, they grow up with much emotional damage. The strong love we’ve extended to our sons and daughter has served to ease that somewhat. I wish you could have heard their testimonies the night we departed…the theme was the same: “I never knew what it was like to have parents until you came into my life.” It is our joy and privilege to love them and to support them in the life God has called them to. #3 Library CD material…my father is scanning English and Amharic books onto CD. 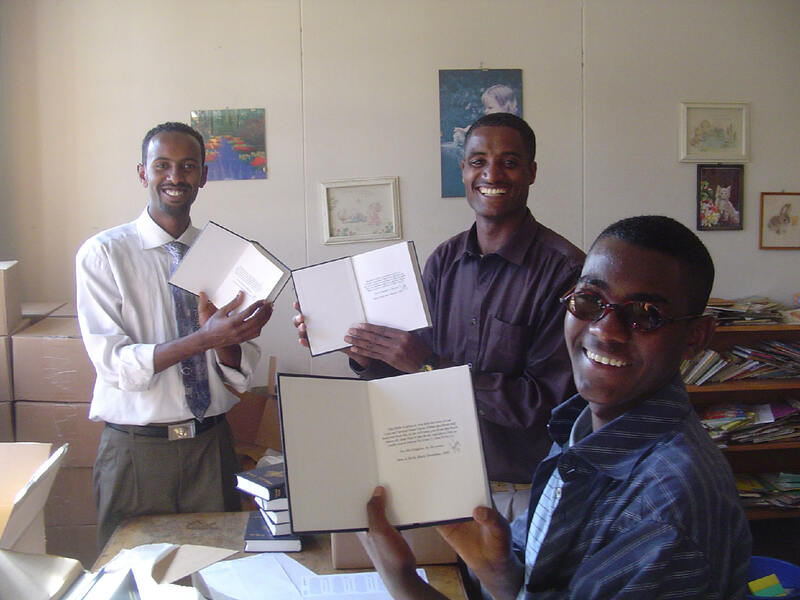 One of our jobs was to survey/evaluate CD#1 and gather Amharic books for CD#2. As computers become more easily accessible, the role of library CDs will increase and will greatly enhance the work of pastors, teachers, and evangelists. We returned with tons of books to be scanned into future CDs. As I look back on the itinerary and prayer calendar we gave you, my heart is full of praise to our Lord for His wonderful provision. Although spare parts could not be found for Fasil’s car, the Lord kept the car working well the whole trip. And although His providence dictated that we pay customs, He also provided the funds needed, and He gave us grace in the eyes of officials. Our suitcases were packed to the brim, and weight rules were changed at the gate, so we had to put the over-weight charge on our credit card; but even here, they “let go” what they could have noticed. By the end of the first week, we were already tired, but His hand went before us, and blessed each activity in His own special way. We had a keen sense of your prayers, and we thank you for them! Next Report: Rural ministry in Burji, the end of the world.